My boys really enjoy a good read-aloud. And I enjoy any time my boys are getting into literature. In a desire to make literacy experiences a part of the memorable scenes of their childhood we’ve started celebrating each family read-aloud with activities that not only increase their comprehension and extend the learning, but also make the reading experience more fun and memorable. This past month, we read The Tale of Despereaux. As the story began, I loved the idea of Despereaux reading those huge books in the castle library, so I used big sheets of easel paper folded in half to make a large book, and made my best attempt at fancy writing to begin the story with those words Despereaux found so enchanting, “Once upon a time…” The rest of the book was blank, and the boys filled them with their own tales of heroes and bravery. As we wrapped up the book last week, I picked up these cute mice for a steal at Ikea. The boys were excited enough with the mice and began telling stories of the adventures they would have, but we soon needed a way to tell each boy’s mouse apart. So, in keeping with Despereaux’s tale, we tied thread around each mouse. (The thread is red in the story, but my boys used their favorite colors to tell them apart.) Of course, not long after that, the boys were asking what they could use for Despereaux’s sword. Luckily, I had some of these plastic needles on hand and so our valiant hero was quickly armed. As these toy mice head out on their own noble quests, my boys are building literary connections, language skills, and creative thinking. Last month our book was Roald Dahl’s Charlie and the Chocolate Factory . 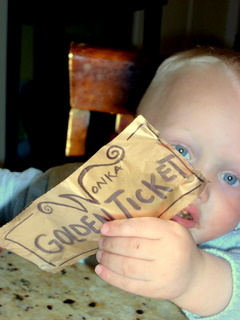 A few day’s after finishing, we surprised our boys with their own golden tickets (tin foil sprayed with gold paint and printed with a good old Sharpie) slipped inside the wrapper of a candy bar. Just like in the story, the ticket was an invitation for fun to come the following day when we made chocolate dipped pretzels and watched the movie. We still hear the occasional references to Dahl’s colorful characters, and just the other day my six year-old commented that he wished he could find money on the street like Charlie did. I’ve enjoyed watching these books become a part of our family memories, and love hearing the boys talk about the stories and activities long after we’ve finished the books. I’m hoping to build a love of literacy and a treasure of meaningful shared experiences. Celebrating a book can be anything from an art project, a themed dinner, or a full-blown party. For me, the inspiration came when a friend of mine, a retired educator who’s passionate about literacy, shared how she had invited all of her grandchildren to read The Secret Garden . After everyone had enjoyed the story, she invited them all to a picnic in a local garden with a beautiful, secluded nook. Dressing in clothes recently brought back from a trip to India, the children talked about the story, danced, played, and even fell in the fountain. It was truly a memorable scene! Have you celebrated any good books lately? Do you have any great books to recommend for our next read aloud? I read the Tale of Desperaux with my first grade class and I wish I had thought of the idea of the giant book. I love that your boys filled it in with their own adventures. This post made my love of books grow even bigger. Loved this post. Read alouds are my favorite part of the day. Do you have a list somewhere of the books you’ve read and the must reads in your future that are best suited to read alouds for kids? I wrote a post here with several lists of great books. Hope the lists help. I’d love to hear more suggestions as well! I think there’s always one more great book to be read! I LOVE these ideas. And summer will be the perfect time for this. Thanks again for the inspiration! Love longer read-alouds for children – Charlie/Chocolate Factory is a must, as is Charlotte’s Web. Great post! I would highly highly recommend the Dragon books by Ruth Stiles Gannett – “My Father’s Dragon”, “Elmer & the Dragon” and “The Dragons of Blueland.” Excellent written series, very kid-friendly with wonderful maps in the front of each book! I have read the series with five-year-olds – boys and girls – and are always a huge hit! We use the maps as reference during the reads and also extend our experience by making our own maps, going on our own dragon hunt and having our own celebration with tangerines (you’ll have to read the books to know why!!). Oh Jeanne, my boys will love those books! Thanks for the suggestion! I’m excited to look over your list as well. Amanda – Oh, I do hope you make the Dragons a part of your reading list with your boys – guaranteed to be a favorite 🙂 I recommend the 3 separate paperback books so that you can fold open the map pages more easily. Happy reading. I’m planning on it! There are so many reprintings, I’m having a hard time determining the order of the series. Do I need to go in order? Do you know what the order is? Oh wait, I think I figured it out! The Dragons will be on their way from Amazon soon! My children and I also love to hear audio recordings of great books together. This started out because for some unknown reason 🙂 reading book after book puts me to sleep! While we of course still read books together, we also enjoy listening to a story, letting our imaginations paint wonderful pictures, and then talking about what we pictured after the story is over. My littlest kids (3 1/2, 4 1/2, and 5 1/2) get a kick out of listening to Robert Munsch reading his stories, while the older kids choose from a variety of stuff. Great suggestions, Rachel. And I have to relate — last week I fell asleep while reading out loud (again!) but this time, my oldest (6 1/2) finished up the last page of the chapter for his brother and the two went off and played before I came to! More read aloud suggestions: Eleanor Estes and Elizabeth Enright books; the Laura Ingalls Wilder books (start with Farmer Boy if you have boys), which lend themselves to all sorts of corollary activities; all the Edward Eager books, and E. Nesbit, too; Charlotte’s Web; How to Eat Fried Worms; and we just got Nicholas by René Goscinny and Jean Jacques Sempé and it’s so funny I had to stop reading at points until I stopped laughing. How about The Wind in the Willows by Kenneth Grahame? Beautiful langauge in the book and lots of adventures. Thanks for sharing your great ideas, Jen. Charlie and the Chocolate Factory just lends itself to so much fun! We just finished reading Charlie and the Chocolate Factory tonight, and now we’re ready for movie and chocolate night! Just curious–did you watch the old Willy Wonka movie or the new version with Johnny Depp? I actually haven’t seen the old version, and it’s been a few years since I saw the new one, and I’m trying to remember if it is appropriate for my 6 and 3 year old. FYI: our next read aloud book will be A Bear called Paddington, likely followed by the Tale of Desperaux. We read the Dragon books last year and enjoyed them. Thanks for your great posts! We watched the new version, which they seemed to like. We do have a Clear-Play DVD player (it sets filters) but I don’t remember it cutting anything. Enjoy your party — and your reading list! We’re in the Dragon books right now and the boys are really enjoying it. Thanks for reading!